Are you a Ruler or an Apple? Does anyone else think these women are in a church production of “Sweet Charity” and about to break into a very proper acapella version of “Hey Big Spender”? I am going to go with:On a playground…the kids have run off to the swings and the pattern captures the women during a break in the childcare action,where they covertly exchange secret family recipes. Yes, I think the blonde is passing some piece of information to the brunette – possibly microfilm – with her left hand. And the brunette, in her cleverness, has made the red midriff band to go OVER the gingham, so that it can serve as a pocket for very flat pieces of intelligence.I think this sort of pattern illustration is what inspires Mabel Maney, author of the Nancy Clue/Hardly Boys books, as well as the romp “Kiss the Girls and Make them Spy,” which is full of gender-bending, mod fashions, and truth-serum lipsitcks, in swinging London (and one of the heroines, Jane Bond, works in a bookshop!). Quite a hoot. Am I the only one who thinks it’s odd how their breasts look like their being propped up by the midriff thingy? Yes, there is something conspiratorial about them, isn’t there? The red dress one is trying to look away and casual about the whole affair. I didn’t notice until now, but take a look at the pointy/bullet bra look of the red dress. Reminds of the foundation garment discussion the other day. Interesting to see this as an adult dress, because I was recently going through a closet in my childhood home and came across a dress exactly like this that my mother had saved. I think I was about 8 (which puts it at 1962) when I wore it. It was brown and tan and I couldn’t identify the fabric. I might have thought it was a kind of stiff, nubby silk except I know it was machine washable.No rickrack, though. And I don’t know why she saved this particular dress. She was an expert seamstress. There, there, now. No need to despair. Just go back to our old favorite, Butterick 4790, add the collar and sleeves and fool around with the skirt.Easy as pie! Well, their hairstyles are too old, but they look like they are on a playground. Surely a grown woman wouldn’t wear a dress like that. I feel like I’m watching a very bad b&w movie this week with all these dresses. 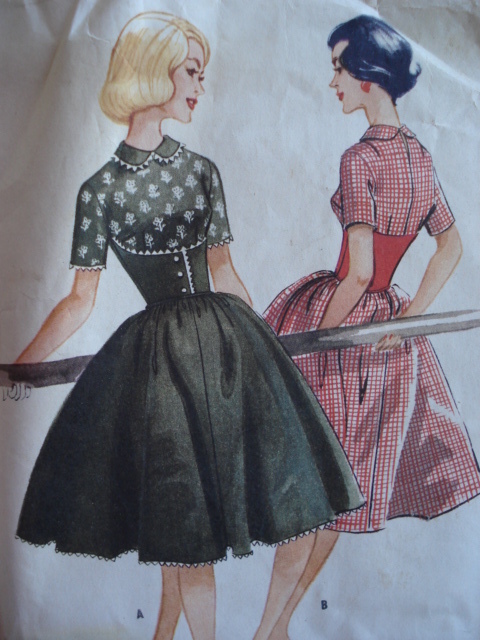 Austrian dirndl…that’s what they are wearing. The girls will grow up to serve beer at Octoberfest.Us hour-glass figure types look hot in those dirndl get ups. Wish they’d come into style outside of Austria and Biergartens.Wish I had the chutzpa to wear a dirndle at ref desk at the library. That would live the place up! Personally, I would love to see anyone wearing dirndle in a library, especially one who actually works there. I say go for it! I’d say they are sharing boyfriend secrets, maybe they are comparing notes….about the same one guy! This design screams “The Bad Seed” to me. Which is not a Bad Thing, per se.I love the Mabel Maney series! I love that movie The Bad Seed!! !Looks like Nancy Drew & George to me. They are having a conversationabout a mystery trying to be as discreet as possible.Peter Pan collars are back in style this year. Well in blouses anyway. Not, that I really care if it is in style or not. I wear what I dang well please & what ever makes me happy.